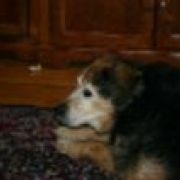 Barkley was one of the most wonderful dogs I have ever owned. He really was a significant part of our family and someone that we will all miss for a long, long, time. I have had several dogs and have two right now. While every single pet I have had will always have a special place in my heart, they will not ever be able to replace Barkley. My son picked out Barkley when we first moved to Atlanta, Ga. in 1991. He was a rescue pup from the Fulton County animal shelter and was probably the runt of the litter. My son instantly knew he was suppose to be our dog and the rest is history. Barkley -- from playing keep away with the tennis ball, to "bedtime", to water fights, to hid-n-seek in the yard, you brought us years and years of happiness and joy. You ALWAYS greeted me with a smile and a wagging tail when I came home and you never had a bad day.